DELTONA, Florida - A Florida woman was arrested Monday after a 3-year-old boy fired her loaded gun inside a vehicle in the parking lot of an elementary school. 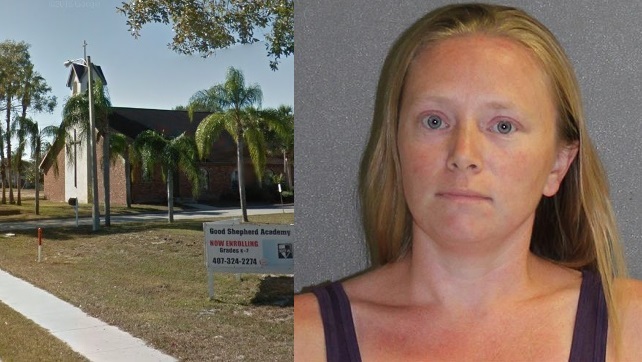 According to the Volusia County Sheriff's Department, 30-year-old Abbie Maldonado of Deltona, Florida, had the 3-year-old with her Monday afternoon when she drove to the Good Shepherd Academy located on Howland Boulevard in Deltona to pick up her son from school. Maldonado got out of her vehicle to walk around and left the boy unsecured in the back of the vehicle with the rear passenger door propped open so that she could keep an eye on the child. Maldonado told deputies that she was walking in the parking lot with some other parents when she heard a loud bang, but didn’t immediately realize it was a gunshot. She then went to the vehicle to check on the boy and then she walked around the parking lot some more. Maldonado said that she later returned to the vehicle and took the child into the school to go to the bathroom, but still did not realize anything was wrong. When she returned to her vehicle again, she heard the sound of glass crackling and that’s when she realized the front driver’s side window was shattered. Maldonado then went to the front of the church to see if anyone had seen someone by her vehicle. When she returned to the vehicle again, she noticed that her loaded gun wasn’t in the driver’s side door pocket where she had left it but on the front seat. It was later discovered that the bullet shattered the window and was lodged in the door frame. No one was injured in the shooting. After checking the child for injuries, she went inside to report the incident to the school. The shooting was then reported to the Volusia County Sheriff’s Office in a 911 call. “Nobody’s hurt, but we had a parent that has a concealed weapon permit and a child got a hold of it and pulled the trigger,” the caller said. Deputies began arriving to the school at 3:45 p.m., and later arrested Maldonado on a felony charge of child neglect. Maldonado told deputies that she normally keeps the gun locked in the trunk. "We are thankful to God that no one was injured," Good Shepherd Lutheran Church and Academy wrote in a statement. "We coordinated our response with the Volusia County Sheriff’s Office and corrective action was taken. This is a reminder that accidents do happen and we encourage everyone to exercise caution and extra responsibility especially on school grounds where so many children are present. We encourage parents to never leave children unattended in a vehicle. Any suspected violation of Florida gun statutes on school property will be immediately reported by Good Shepherd Academy to Volusia County Sheriff’s Office."